The Parelli Program is an excellent foundation for performance horses and trainers. We will help you develop your horse mentally, emotionally and physically. We are very good at it because we invest lots of time in research and continuing educating to understand all kinds of horse behaviours. It is not until your horse is confident, calm and willing that you can develop your feel, posture, position, technique and advance your skills as a rider. For us to get our horses to the point where we can develop as riders, we first need to address other issues in training, psychology and behaviour. As a horse trainer it is your responsibility to teach your horse what you need and want him to know. As his teacher you need to be a good communicator, have a plan, and be knowledgeable, disciplined, patient, and focused. Understanding equine psychology will allow you to engage your horse’s mind, rather than manipulate him against his will using physical force. It’s about getting your idea to become your horse’s idea, but understanding your horse’s idea first, and knowing what strategies to use in the appropriate moment. This knowledge will help you to know when to retreat or use reverse psychology, and when to be progressive, provocative and make rapid progress. Having a plan that allows for productive training sessions is instrumental in being progressive with our horse. The importance of being flexible in our training to match our horse’s behaviour is necessary, and knowing and understanding when to use Behavioural Balancing exercises is the key. By being more than just a rider we are committing to be a horseman. Now it is our responsibility to develop ourselves and develop our horses. 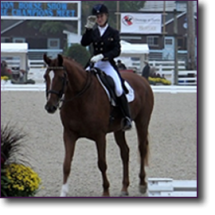 The Parelli program has been instrumental in building the confidence and trust of one of my Grand Prix dressage horses. Flirt started as a horse very afraid of other horses, and of many things in his environment. It is amazing to me how much more self-assured he has becoming with the techniques taught. I am learning to understand and respond appropriately to his particular needs. And his trust in me as a leader has blossomed. The pathway for training and competition goals is to lesson with a qualified licensed Parelli professional.